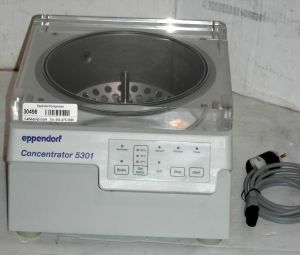 Product Description The Eppendorf 5301 concentrator concentrates DNA/RNA, nucleotides, proteins, and other samples quickly; reduces concentration time by up to 20%. Narrow, 33cm (13") width saves valuable bench space. Two rotors can be stacked for 96 x 1.5-2.0mL (INCLUDED) or 144 x 0.5mL microcentrifuge tubes (NOT INCLUDED). Automatic vacuum release prevents sample loss due to bumping and foaming. Brake feature enables a fast stop for quick access to samples. Three aeration modes (aqueous, alcohol, off) enable maximum evaporation efficiency and prolong pump life by periodically aerating vacuum line and preventing condensation build-up. Clear, weighted lid allows sample viewing and seals the chamber without use of grease. Vacuum pump is NOT included and is available at extra cost.